Here is an interview between Santo Domingo project coordinator Nelson Figueroa and Samuel, a 17-year-old sponsored youth from Santo Domingo. Q. When did you start playing baseball? Q. How often do you play? A. I play every Saturday and Sunday in the league. Monday, Tuesday and Thursday we have practice in the league, but I play with my friends every time I can. Q. What do you think about baseball and why do you like the game? A. It is very important and very good. It helps my muscles and allows me to be in shape by being active all the time. It keeps my mind busy and away from unhealthy environments. Q. What position do you like to play? A. Center field because you get many balls and can throw them to the bases. You run a lot. Q. What is the best thing you ever did in a game? A. 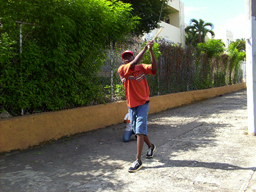 Once I was playing against the team from Azua (Azua is a province in the south) and I grabbed a ground ball and threw it with all my strength to home plate. The player was out and we won the game. On another occasion, we were in Barahona (another province in the southeast). I was playing with my team. I had to bat and I hit a home run out of the field. We were losing, but the team got energized by it and we won the game. By the way, I have never done it again! Q. Who is your favorite baseball player? A. Pedro ìEl Grandeî Martinez. 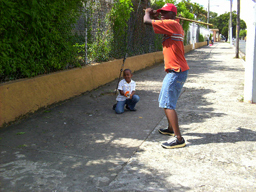 Did you miss Nelson’s blog post about baseball in the Dominican Republic? Read it here!